Congratulations to my girlfriend for graduating from Cal State Long Beach with a bachelor's degree in Political Science! 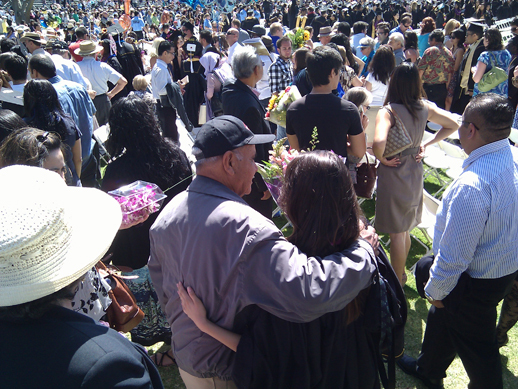 The graduation ceremony was held on campus in an outdoor pavilion on a warm, sunny day. Traffic wasn't cooperating with us that day (does it ever in Los Angeles? ), and we were living dangerously as I dropped my girlfriend off so she could file in with the procession that was already entering the pavilion. I parked the car in an outlying lot and took a shuttle back to the graduation ceremony. Here I was, by myself in an unfamiliar campus, armed only with the knowledge that I needed to find my girlfriend's family in section 2 of the stands. The procession of graduates was still taking place, which halted spectator traffic into the pavilion, so I found a shady spot and waited until the graduates happily found their seats. After the procession ended, the spectators started to move into the pavilion, but there seemed to be little progress. Great. I had gone from a traffic jam on the highway to a traffic jam on foot. I realized that people walk like they drive: slow and confused. People were only waddling as fast, or slow rather, as the person in front of them waddled. People were stopping in the center of the entrance, looking around for their relatives, yelling on their cell phones and bumping into people, all the while preventing other people from entering the pavilion. These are the same people that operate 5,000 pound steel machines of death that fly at you at speeds in excess of 80 mph; AKA SUVs. Kinda scary if you think about it that way, huh? Having worked as a bouncer in a night club back in my college days, I sliced through the crowd like a hot knife through buttah. Every time someone left a gap large enough for me to fit, I stepped into it, commanding my presence towards section 2 of the stands. People around me were tip-toeing to see what the hold up was in the front, but I didn't care. I just kept moving. Once I got out of the crowd, it was a completely open pathway, kind of like once you get out of traffic on the freeways. There's no indicator of what was causing the traffic; no accident, no stalled car, probably just some brake happy driver and a bunch of sympathy slowers (people who drive slow because they feel bad that everyone else is going slow, even though their path is clear). 1. Have an overall goal that can be as broad as you'd like. 2. Move forward with clear intent. Don't let a crowd of confused people get in your way. 3. Don't look back or worry about what's in front of you. If you move forward with these guidelines, when you are approaching your goal as an artist, musician, actor, etc someone will take notice and show you the way to your final destination. Congratulations to my girlfriend for being a trailblazer! She's the first in her family to graduate from college! Don't be a sympathy slower. Never give up! Never surrender!